At 608am, Averey Elizabeth enters our lives with the most beautiful cry. My heart springs from my chest. So amazing. So beautiful. No roses, candles, or red … but the romance is there. How was going to paint sound? 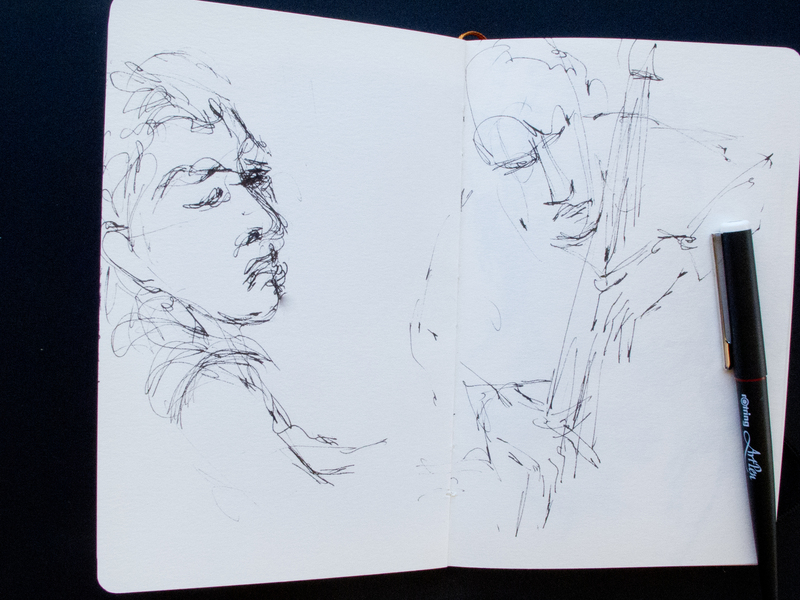 The concert started – I listened – tentatively, I started to sketch what I was hearing. Interpreting the concert in a whole new way, I made one drawing after another listening to the notes build and fall, soften and sprinkle. It was like being on drugs. I was full of music. One time I came out of that world and looked at Mehldau sitting there, playing the piano, my mind drawing what I saw. How different. How much richer my experience of drawing and listening had become. I’ll be breathing lighter whatever I do. — Debra of Breathe Lighter, You know how hot it is by the way you worry about your worms. I have dreamed of being close to nature once again. I didn’t think I’d experience it in Palawan. I wished for a summer away from the artificial pools. Instead, I longed for natural pools we can wade in. I wished for green, majestic mountains we can gape at. 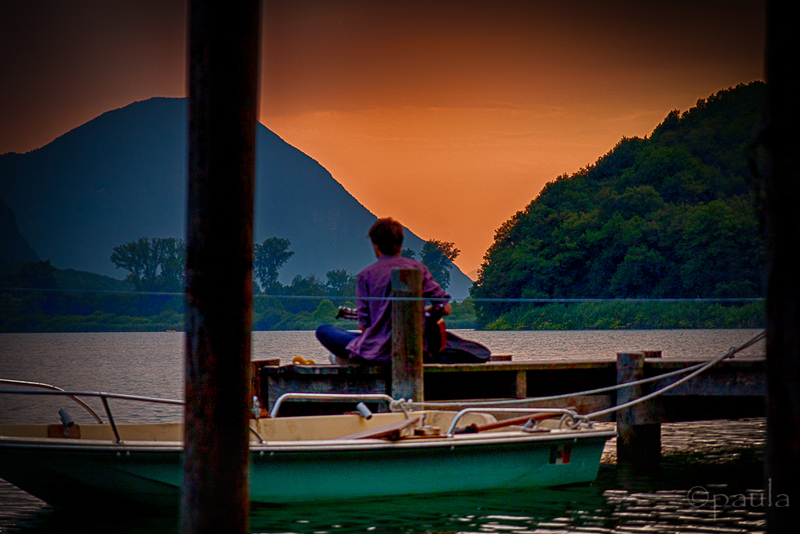 The scene takes me to Lago di Piano, a small lake close to Lago Lugano in Italy. Words were superfluous. Music was the only thing that could complement the setting sun over the still lake. Great job, Rommel! It must take you a long time to do this! I appreciate this post a lot. I will come back to follow the link and check each one out. You are super (great person, writer, photographer…), you know that? This post shows who you are! Between you and me 😉 I’m having trouble too. 🙂 I’ve had a time away from blogosphere, I always go back to it. I’m so glad I found again your shot of the surfer. It belongs to a magazine. You know they have a good number surfing photo book/magazine, I think you should submit that photo. Wow! Awesome work! Well done Rommel. I find you very creative, generous, artistic, good eye on the camera. Including me in the company with other great bloggers is such an honor. Congratulations on your 300! and here’s to 300 more. Yours is a very kind tribute, Rommel, not only because it highlights talented and thoughtful bloggers but it illustrates your attentiveness to their words and artistic gifts. Several of those you’ve highlighted I follow. Others will be explored given your appreciated, virtual introductions. 🙂 Congratulations on having the perseverance and commitment to share so much with us through your blog. Thanks for your concern. I’m safe and sound, milu. Ow, I love your quote on this post. It’s resounding. Really a great addition. hi rommel, this is such a nice post.. congratulations for reaching 300 and don’t forget to share your greece adventure in the future. Thank you for the mention of my blog Rommel. Perhaps one day we will meet in person in Italy. You know well that I would so love to go back to Italy. I think it’s the top country I’d like to revisit again. Hi, where is my blog in your post? Next time don’t forget. Thanks for a colorful gallery. always love your posts, and that is a spectacular shot!!! 🙂 congrats!! Thanks Jude. Just so you know … for a long time … I was set on your ticking dandelion clock 😉 …. then I changed my mind at the end. Oh well, it’s nice that you ended up starting the last calls pics. What a beautiful post Rommel…I’m honoured to be included amongst such an amazing group of bloggers and photographers. 🙂 And cannot wait to see the next 300 posts and read all about your adventures in Greece. 2 years! Amazing! I still have so many place to explore here in Cali, but I can’t wait to go to Greece! Wonderful post, Rommel. What a gargantuan effort – thanks for bringing so much beauty into my day. And, of course, for the mention. You have so many awesome posts with expert pictures and beautiful words. You gave me a headache! 😀 when I was choosing yours. You are such a generous young man. Thank you for being you. *300* … such a milestone Rommel , a great achievement considering the demands on your time . Thank you so much for including me in this special post of yours , it’s quite made my day .. I’ll be hopping over to see the others very soon . You’ve come a long way, poppy. I’m happy for your blog. Nice work Rommel! I’ve been following you for quite some time and enjoy your posts. Keep up the good work! Hi Rommel- This is a very nice post. I know it had to take a lot of time to create. Congratulations on your 300th posting!! Blogging takes so much time and dedication. Good luck with your next adventure in Greece. What a beautiful country- I’ve been there once and was very impressed with Athens and the Greek Isles and the people there seemed quite nice. It was a looooong process. But seeing the result now, I think it’s awesome, and that all the hard work and time paid off. Ahh my dear Rommel, first of all congratulations on your 300th post! Next thank you, I’m honoured to be included here 🙂 Then thanks for sharing all these posts, many from people I know and love and some new to me. Last of all keep doing what you’re doing please 🙂 you brighten up the blogosphere! Seeing my work there is very humbling. You made me feel like I am featured on Freshly Pressed. Thank you very much! Anyway, I’d like you to know I leafed through the pages and I’m glad I did. I was deeply moved by the quotes from all the bloggers. Words are indeed powerful. Nearly all of them made my hairs raise. The same goes for the pictures at the last page. Hope to see more of these in the future. Three cheers! It was sooo rough finding the right quotes and, on top of it, the image to go with the words. It was rough, but it was really really nice revisiting and viewing the beautiful words and images of these awesome blogs. Congratulations, Rommel! Every single post of the 300 is remarkable. This one is awesome! Just let me know once you changed it… Beautiful image, I must say. be ready for you tomorrow. Thank you Rommel for including me in your list. It is an honor, and very generous for you to do this for your fellow bloggers! I look forward to your adventures in Greece, and all your posts in between. We’ve been to similar places. I’m glad to have found your blog with awesome, professional pictures. It was an awesome process looking at these wonderful blogs with different voices and approaches. Hey Rommel! Congratulations on your 300th post. You always make your readers “feel” as though we are there sharing the experience with you. For that, I salute you my friend. Keep the posts coming! Thanks Mike. Do you still blog? Thank you for including me. ☺️ Touched and honored. What makes you beautiful as a blogger is your generous soul. You give much of yourself in words and scenes while recognizing the work that others put out there too. Lookin forward to 3000 more posts and beyond! What a gorgeous collection of quotes and pictures! Very nicely done. thank you for collating these wonderful posts – all so worthy of the spotlight that you have given them in your blog. I so agree with the quote that the best thing we can give our loved ones is time. In the fast paced world of many demands that we live in, that truth seems to be harder and harder for so many (myself often included!) to live by. I’m so glad I found your blog, and will be back for more! Congratulations on #300, that is an impressive achievement as with the quality of each of these. The collection of quotes/photos you have above are impressive, really like – The Island Traveler of this man’s journey, On Top pf Bluebonnet Field of Dreams. Well done, and look forward to more amazing posts! Thanks Dalo. The Island Traveler is really topnotch when it comes with Hallmark words and images. I’m highly impressed with your blog. With yours, I had so many images and quotes to choose from so it wasn’t too hard. I really loved your Art of Devotion post, but I had to go with a new one so I choose your quote from Positive Envy. Thank you Rommel ~ really appreciate it, and that is one of my favorite photos too! Cheers. Rommel, first of all Congratulation with your 300th post here! You are productive, creative and artistic person. All your posts are informative and interesting. Looking forward to read, see and know about your new journey and experience. Second thing, I am really proud you mention my post in your lovely list of the blogs. Thank you very much! The collection of the blogs in your list is worth to read and follow. Good Luck with your future numerous posts! Wonderful post with lots of great quotes and photos. Plus a surprise for me near the end! Thank you very much for the surprise and this post Rommel. Keep on posting quality stuff like you always do. Can you pitch that to my employer? 🙂 Finger-crossed. Actually I’m thinking Colorado. If only I had that power! Hahahaha! It’s beautiful in Colorado in fall. It’s closer to Cali and you still get to see the beautiful colors of fall. I haven’t been there personally but I’ve seen photos and some of my friends have been there. One of them actually just got back from a road trip not too long ago. Phew! I’m relieved to know that you haven’t set me such a big task. I’ve already read more than half of these 🙂 Now to find some time for the others. 300 is a great number. And all of them a great read, Rommel 🙂 Here’s to the next 100! Cheers indeed! Getting to my centennial post was no easy feat. Thanks for the award and for perusing my blog, moorezart. I want to thank everyone who celebrate with me. It was a time-consuming but rewarding process. I enjoyed re-reading blogs and visiting these blogs and all the other blogs. To put it and see it all together in one post, I really am very content with that accomplishment as well as achieving the 300 posts. Thanks again, and have fun blogging as always. It’s amazing how time flies. It seems like it’s faster when you see it from a child’s growth. I love that post. I’m so ready for Survivor! Thank goodness no Redemption Island this season. It just doesn’t work when it comes to love ones season. Exile will be fine. I’m curious how well the TAR twins do in the game. They were awful in the All-Star season of TAR. Thanks for including me in your 300th post. I always enjoy your music in drawing posts. LOL Love the last photo with your closing statement! I’ve been away from your blog as well. For some reason, sometimes I go there it won’t upload your page. Thanks for always paying attention to my Featured blogs. Congratulations, Rommel on your 300th post and on your efforts to compile this enormous project. I can see that you have put a lot of thought and consideration in selecting the right photos to represent each blog. Also, you have introduced me to some new ones. That’s indeed a beautiful promenade through WordPress gallery. Thank you for making me part of it. It was a long arduous process, but seeing it now in complete makes it all worth it. Good picture of you, Rommel. And YAY on the 300th post!! I aspire to get there.